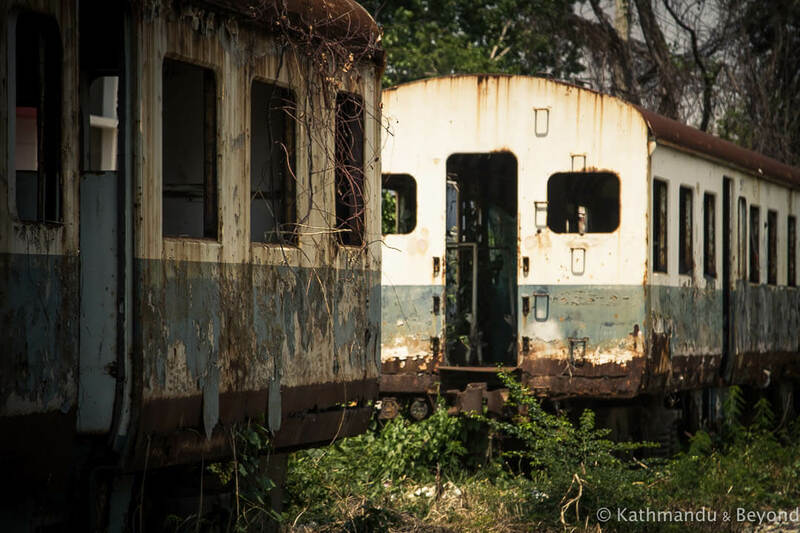 We spotted these disused railway carriages (more photos below) while riding the Maeklong Railway, a narrow-gauge line that leaves from Bangkok’s Wongwian Yai station and travels to the market town of Maeklong. 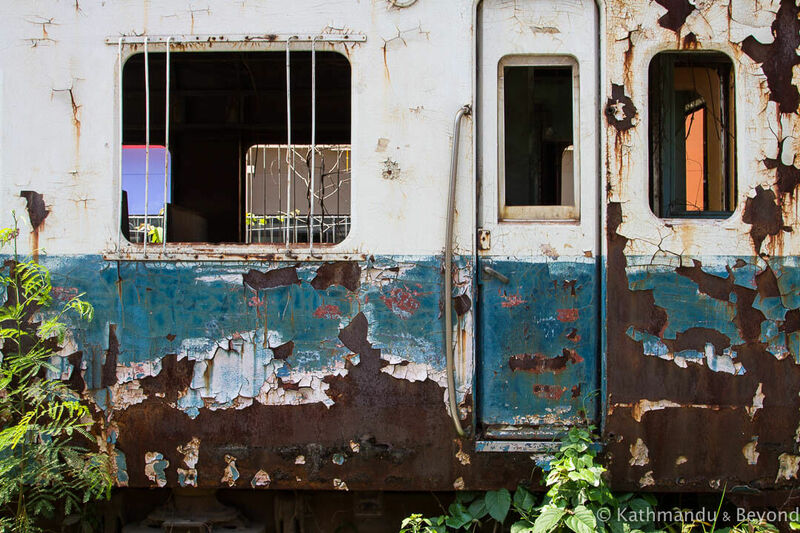 The journey isn’t direct and, en route, we had to get off the train in Mahachai, also known as Samut Sakhon, jump on a ferry to the other side of the Tha Chin River, walk a little to Ban Laem station and then board another train that eventually took us to Maeklong. 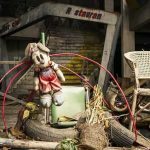 It’s a slow but interesting journey that affords an absorbing glimpse of the suburbs of Bangkok. 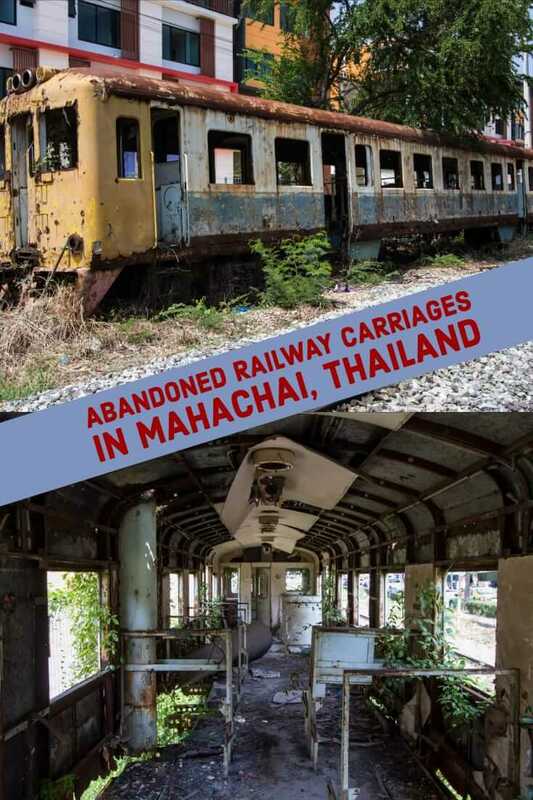 This isn’t the main reason to travel on the train, however, and neither are the extremely photogenic railway carriages at Mahachai. 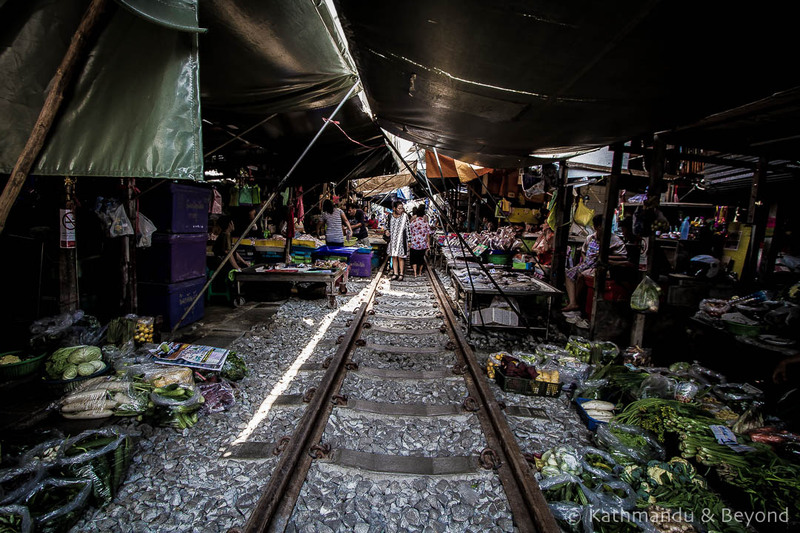 The highlight is right at the end of the line when the train reaches Maeklong. As it approaches the station, the train passes right through the centre of the town’s busy market, which is situated either side of the track. This happens four times a day in each direction and just before the train arrives or departs, the market sellers move their awnings and shop fronts back in order for it to pass through. It’s quite a sight, especially if you are actually on the train and looking down on all the goings-on. What’s more, it’s not such a big deal for the market traders as you first might imagine. They all know what to do and when to do it and pulling back their awnings etc. is pretty much all that is necessary. There’s no need for them to move any of their goods or produce as the train is high enough that it simply travels over the top of it all. It won’t come as any surprise to learn that the nickname for the market is ‘umbrella pulldown market’! 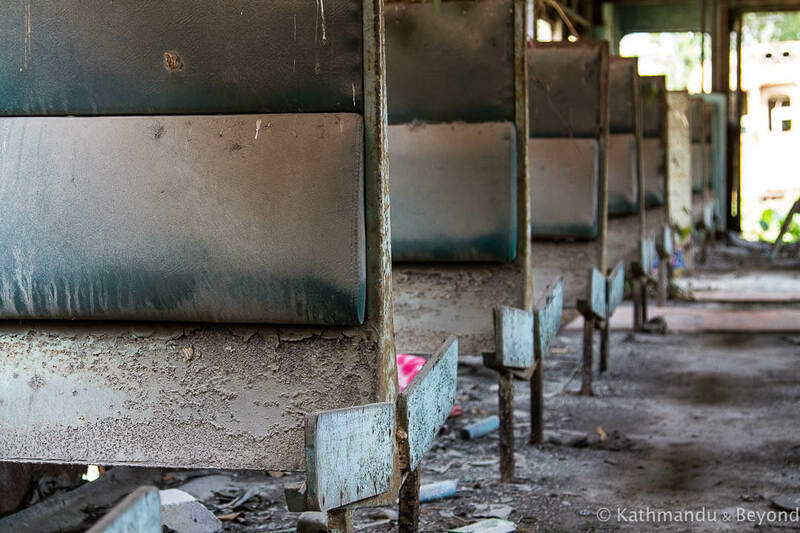 On our return journey to Bangkok, we had time to kill in Mahachai before our train departed. 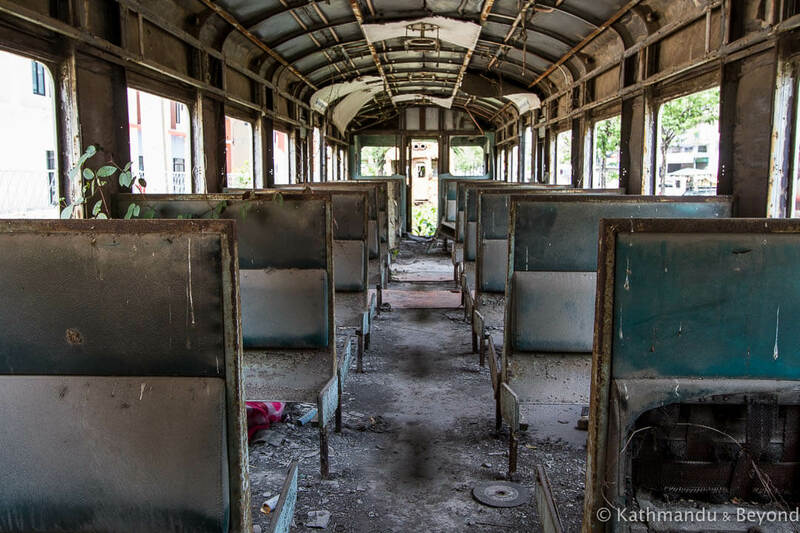 Naturally, we made a beeline for the railway carriages that we had only previously glanced out of the train window. Rusty and decaying, they were right up our street and we had enough time to clamber around and take some photos before heading back to the station to catch our train. 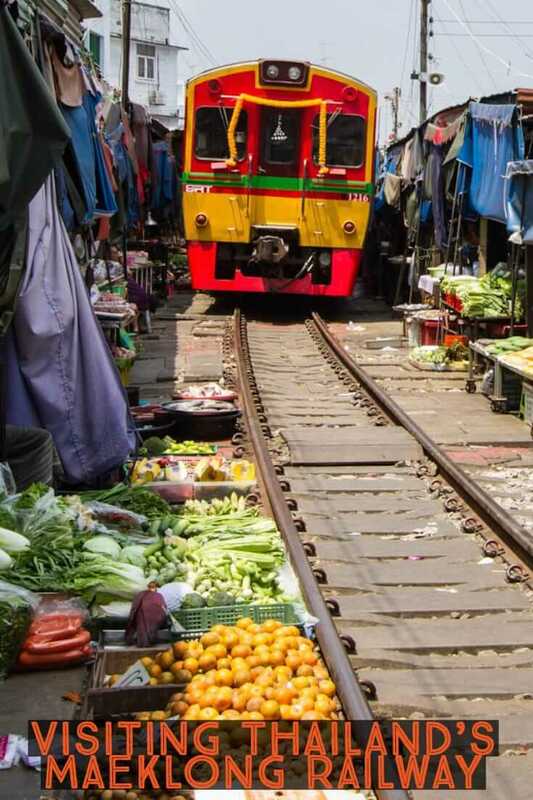 First of all, if you want to watch the train actually travelling through the middle of the market at Maeklong, you can’t be on it in both directions as there is no way of alighting the train before it enters the market/station or vice versa. The way we did the whole journey worked out well and allowed us the experience of being on the train and passing through the market as well as the chance to photograph it as it left the station. 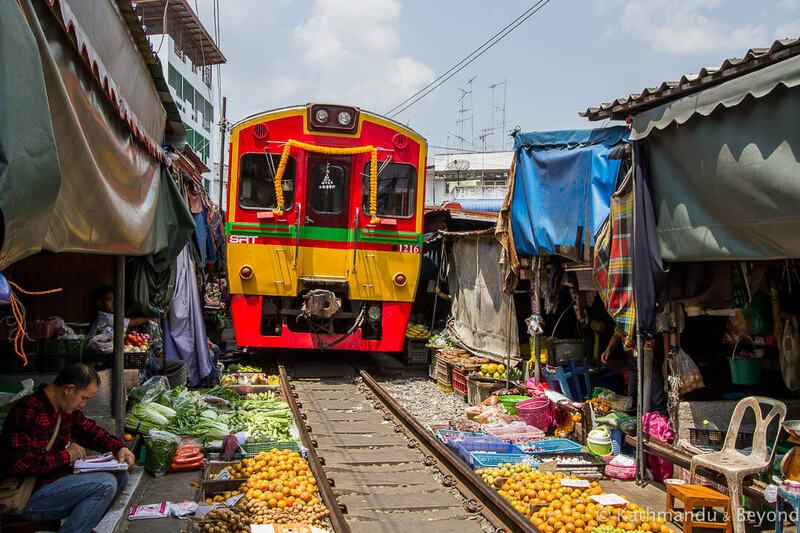 There are plenty of trains between Bangkok’s Wongwian Yai station and Mahachai but only four trains a day between Ban Laem and Maeklong so it is best to plan, particularly as it is necessary to cross the Tha Chin River halfway through the journey. 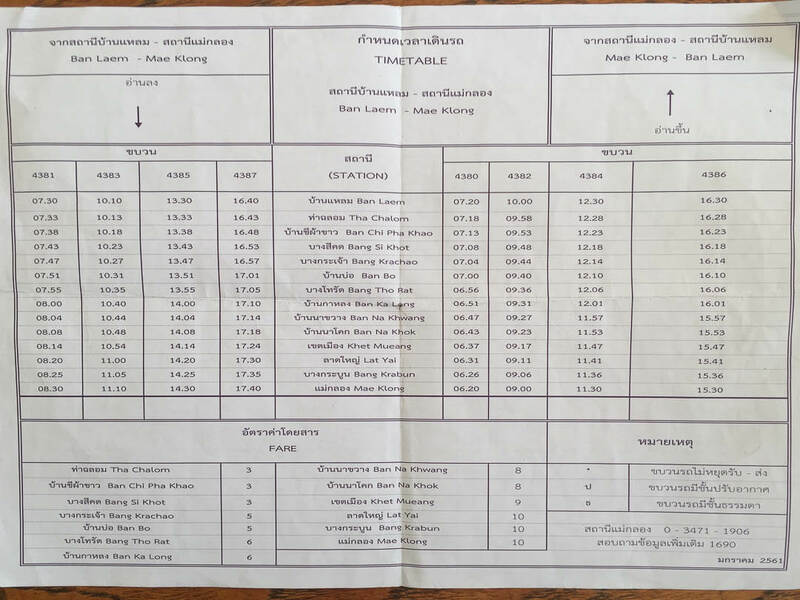 The Maeklong railway market train schedule below is valid as of March, 2018 (click on them to enlarge). We took the 0740/0839 Wongwian Yai to Mahachai service and connected with the 1010/1110 Ban Laem to Maeklong train. 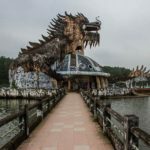 This gave us enough time to have a quick look around the fish market in Mahachai as well as cross the river by ferry (10 minutes/very regular) and walk the 500 metres to Ban Laem station. 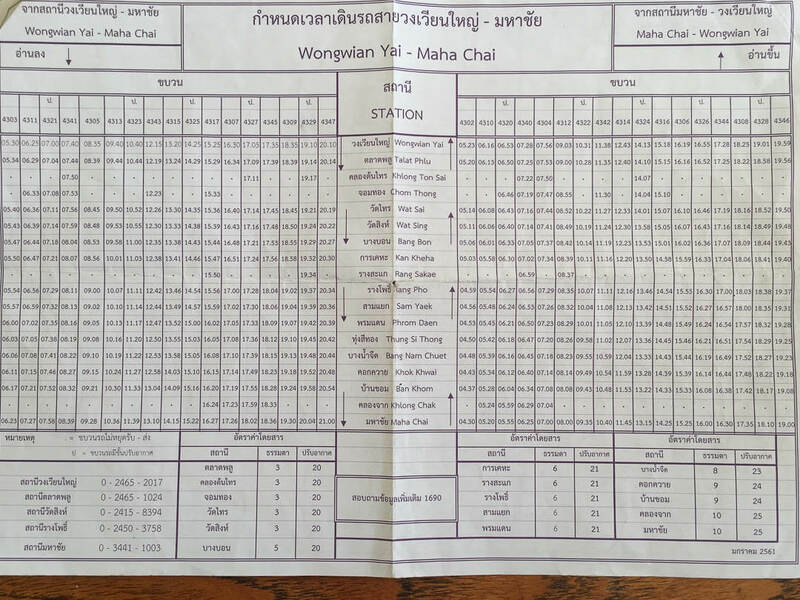 You can also check the schedules with the State Railway of Thailand. Mahachai railway station, the ferry pier and the fish market are all very close to one another. 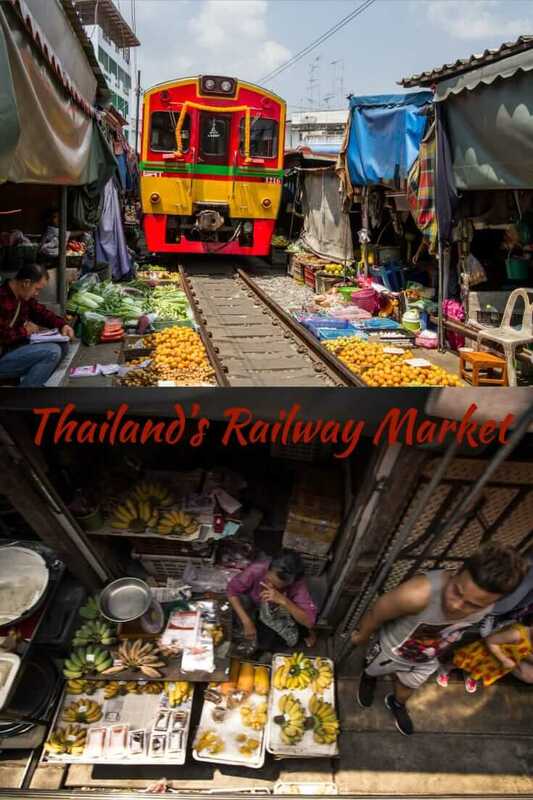 If you want longer at the market, which is one of the largest of its kind in Thailand and at its most active in the morning, i.e. not worth visiting in the afternoon, then you could take the 0700/0758 train instead. On the other hand, the 0835/0928 just about gives enough time to get across to Ban Laem station and connect with the onward service but it won’t allow any time for the market and doesn’t factor in delays. 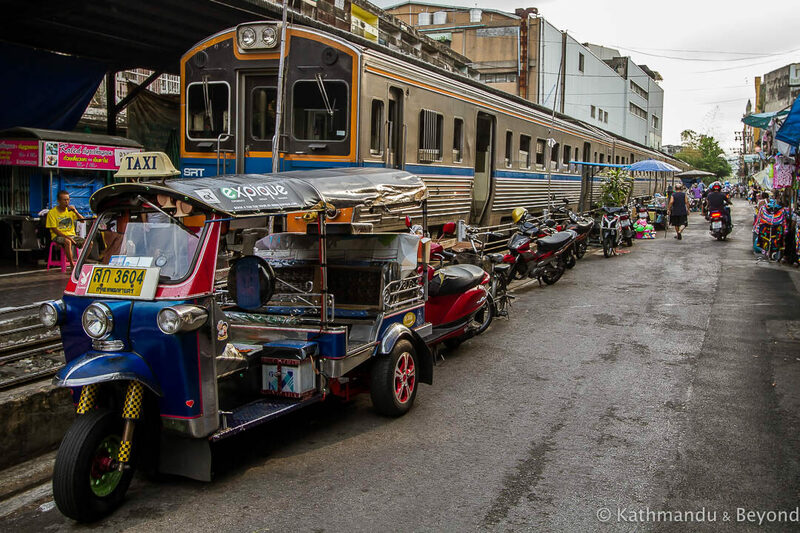 In order to get our shots of the train passing through the market, we decided to take a minivan back to Mahachai. The train back departed at 1130 and after watching it head out, we spent a bit more time looking around and then walked to the nearby bus/minivan station (about 200m east of the market) where we didn’t have to wait long for transport to Mahachai (journey time 35 minutes) (*). 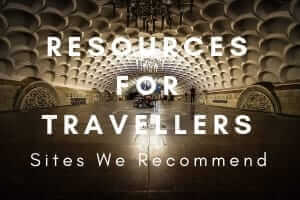 (*) Our other option was to take the 1530/1630 train back to Mahachai but, apart from the market, there is little else to do in Maeklong and four hours there would have been too long. 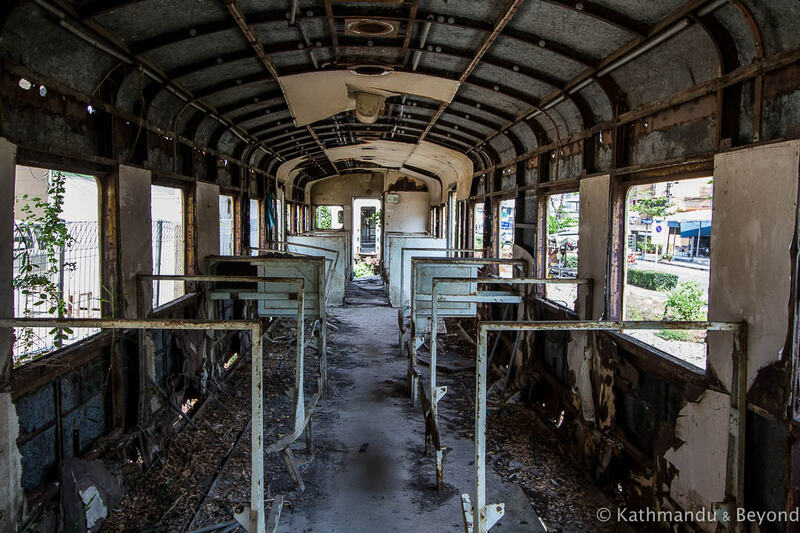 We spent an hour or so visiting the abandoned railway cars in Mahachai and then took an afternoon train back to Bangkok. 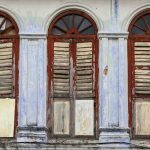 A couple of beers at one of the trackside bars at Wongwian Yai station and et voilà or Robert is your dad’s brother (Bob’s your uncle) as we say where I come from – a thoroughly enjoyable day out! 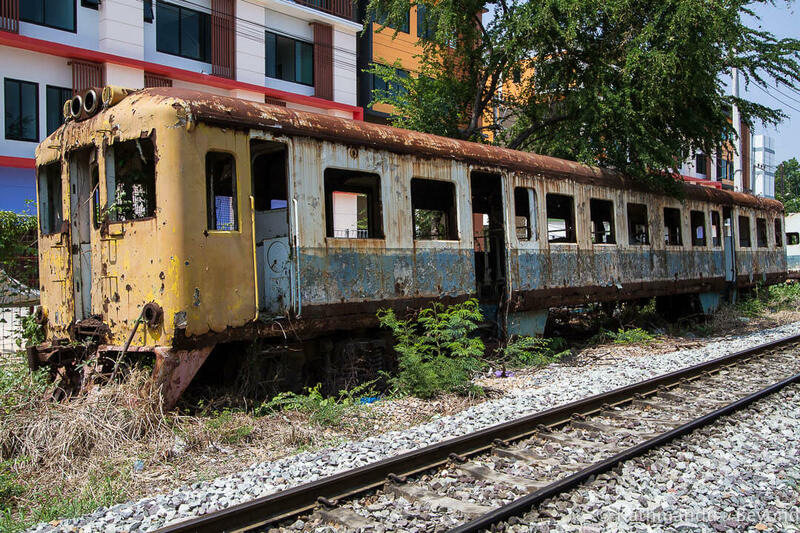 Wongwian Yai Railway Station in Bangkok. Walk down the platform a little bit in order to find the cheap beer! Leo beer at Wongwian Yai 80 baht per large bottle, which is good for Bangkok! And finally, if you want to see the railway carriages, the GPS coordinates are 13.548850, 100.282541. 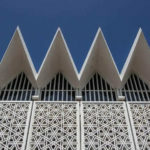 They are located on a side road next to Landmark Mahachai shopping centre. 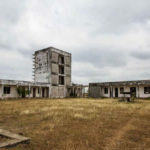 You may get some bemused looks from locals, who will wonder why you want to clamber inside some knackered train cars but nobody will say anything and you can go where you like. The carriages are located 850m east of the railway station.